Did you know that Rush and Judy Collins both wrote songs about the Space Shuttle? That excess Shuttle propellant is used in a small device that burns through and safely ignites the explosives within land mine casings? That Varicella-Zoster virus, the causative agent of chicken pox and shingles, appeared in the saliva of asymptomatic astronauts while in space, leading to development of a rapid, sensitive test that doctors could use to diagnose shingles and facilitate early antiviral therapy? These are just a few of the remarkable facts packed into a spectacular new book from NASA: Wings in Orbit: Scientific and Engineering Legacies of the Space Shuttle. 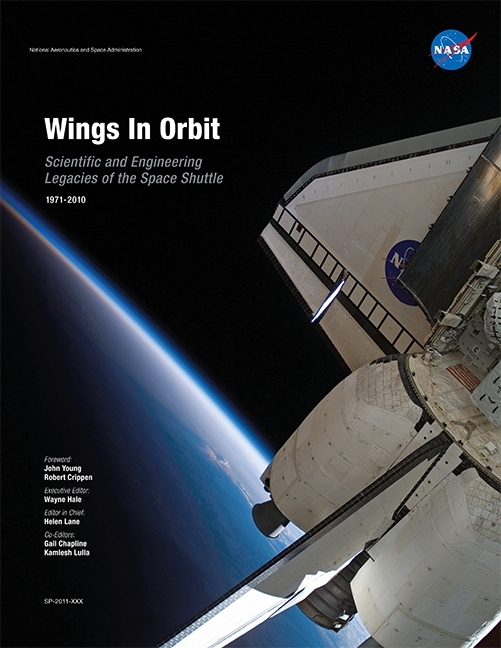 Published to coincide with the ending of the Space Shuttle program, Wings in Orbit is a beautifully illustrated and information-filled collection of essays on just about every aspect of this long-lived and amazingly productive scientific and technical achievement. After a through review of the history of the Shuttle program, including the Challenger and Columbia accidents and the role of the Shuttle in national security, Wings in Orbit goes on to cover its engineering aspects, scientific discoveries, social, cultural, and educational legacies, industries and spin-offs), and testimonies from the famous and not so famous about the Shuttle and its role in human spaceflight. I’m not a real space buff, but I found this book totally absorbing. Also, it’s profusely illustrated with color photos and diagrams, although the photo that most intrigued me was totally monochromatic – a shot of Mt. St. Helens just after the colossal eruption of May 18, 1980. Absent the caption, I would have supposed it to be a photo of the moon or Mars – a striking tribute to the power of nature and the unblinking eye of the Space Shuttle. You can get a taste of Wings in Orbit here, purchase a copy here (and I understand that at least one major book chain may be stocking it), and browse in a copy at a library.